DES MOINES, Iowa — Several Democratic presidential candidates will make their case to Iowa farmers on Saturday — part of a broader effort to win over rural voters who have drifted to Republicans in recent years. Sens. Elizabeth Warren of Massachusetts and Amy Klobuchar of Minnesota are among the White House hopefuls who will attend the Heartland Forum in Storm Lake, Iowa. They’re likely to tout proposals they released this week aimed at helping rural communities. The attention on agricultural communities and issues is the result of a recognition that Democrats need to do more to win over rural voters, especially in places like Iowa. This state has long been a presidential battleground that swung between Democrats and Republicans. But Iowa has trended more solidly Republican over the past two election cycles, a troubling warning sign for Democrats seeking to oust President Donald Trump. “There needs to be a better connection made between politicians and rural Americans,” said Aaron Heley Lehman, the president of Iowa Farmers’ Union, which is hosting Saturday’s forum and busing in members from neighboring states to hear the candidate pitches. In the early days of the 2020 Democratic primary, many candidates are focusing on building that connection. Warren rolled out an extensive agriculture policy this week that would help family farmers by breaking up big agriculture monopolies. 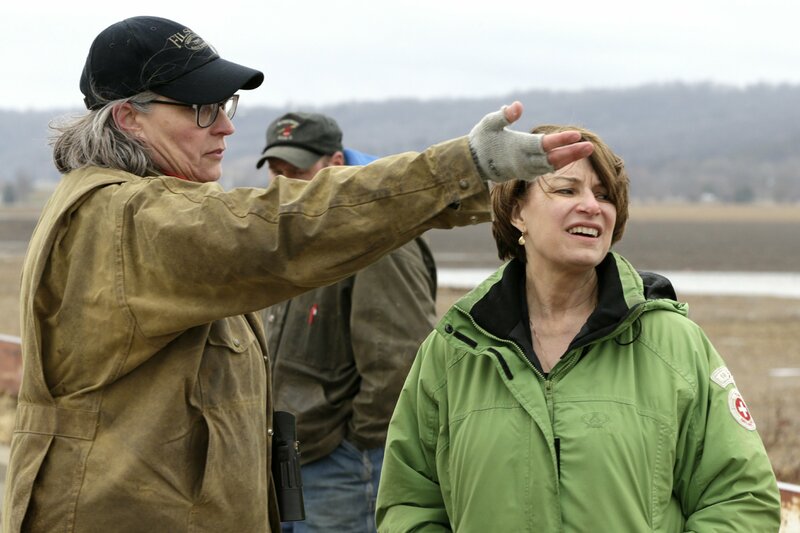 Klobuchar announced a $1 trillion infrastructure policy that she spoke about while surveying flooding damage in Iowa this weekend. And former Rep. John Delaney rolled out his own policy aimed at revitalizing rural America, which includes a focus on farming and rural infrastructure. Several contenders, including former Texas Rep. Beto O’Rourke, have campaigned in parts of rural Iowa that haven’t seen much Democratic activity in years. Former Rep. John Delaney is the only Democratic candidate so far to visit all 99 of Iowa’s counties. That’s a key part of what Democrats need to do to win back rural America, according to Iowa state Rep. Mary Gaskill — simply show up. “There are a lot of people who are hesitant to come out as a Democrat, because they all feel neglected, or abused or shunned by their neighbor,” she said. Gaskill is the only Democratic lawmaker in her area, and represents a red county that went for Trump by more than 20 points in 2016 — but one that Barack Obama won by nearly 12 points in 2012. Now, at least two candidates — Sens. Cory Booker and Kirsten Gillibrand — have campaigned there, a development Gaskill welcomes. “We might see our neighbors there, that we didn’t know they were Democrats,” she said. O’Rourke won’t attend Saturday’s forum. But his first Iowa swing as a presidential candidate included stops in small towns that swung from Democrats to Republicans in 2016. He didn’t change much of his message — during the swing O’Rourke still talked about the need for gun control, legal marijuana and a compassionate immigration program. But his top strategist in the state, Norm Sterzenbach, said the key was to bring those policies to people that hadn’t heard directly from Democrats before. “Maybe those ideas you like, maybe you don’t, but you’ll never know if we’re not in there communicating,” he said. New York Sen. Kirsten Gillibrand recently visited the same swath of eastern Iowa, pitching herself to voters as a candidate who could defeat Trump because she’s won in red areas of New York. She, too, didn’t shy away from embracing progressive policies like gun control, universal health care and the Green New Deal, and she touted her work on the repeal of Don’t Ask Don’t Tell, the policy prohibiting gays from serving openly in the military, everywhere she went. Neither Gillibrand nor O’Rourke won everyone over. Tom Courtney, the Des Moines County Democratic Party chairman, hosted an event for both candidates and said he wasn’t impressed by their message. The rural forum will offer candidates the opportunity to discuss policies that will have a more direct impact on rural voters and farmers — and explain how some of their more sweeping proposals, like the Green New Deal, would help at the local level. Lehman said he believes there’s space in the conversation with farmers to address things like climate change and immigration, but candidates have to start bringing that message directly to them. “We’re encouraged that candidates are spending time and energy to think about what good rural policy is — we hope that the thing we’re doing on Saturday is the beginning of the conversation we’ll have all during the caucus season,” he said.